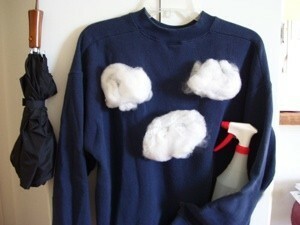 Talk about a frugal, quick, inexpensive costume, this is it! Take any plain, solid-colored sweatshirt (preferably dark), glue or use double-stick tape to adhere some white pillow stuffing a little below the neck of the shirt (in the shape of a cloud), then fill a spray bottle of water and take an umbrella with you. When asked what you are, open the umbrella, spray the person lightly with water from the bottle, and announce: "I'm partly cloudy, with a chance of rain!" I love this idea, thanks!